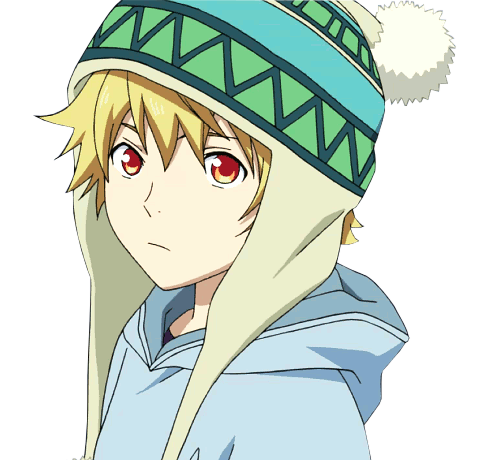 Spirit: Yukine, Regalia, Spirit of Emotion.Yukine face claim below. Age + Birthdate: December 7th, Year unknown.Actual age unknown. His powers rely mostly on Yukine.He specializes in combating spirits and evil forces, but can easily do the job with most anything.Yukine transforms into a physical sword, completely indestructible and can cut through virtual anything with enough focus.Each of Yato's emotions changes the effect the sword has.And by anything, it extends to even shadows and light, to even destroying someone's memories of someone else, "cutting their ties." Angry: Increased power, a strong "push" after a movement with the sword towards an enemy. Sad:Causes the sword to be invisible by being covered in concealing winds, making it impossible to judge the length of the sword. Confused: He would be in a sort of state of complete confusion, moving randomly in different directions, or so it seems.His body would react on it's own independently from the brain when Yukine takes over. Sleepy:Slows down tremendously, except for his arms.He moved in a floppy style, but his attacks become much more effective. Focused: Sword becomes coated in lightning and has a burning affect with every cut landed. Evil:Sword would poison enemies, a special nuerotoxin that targets the lungs and muscles.It takes effect quickly, but doesn't kill.It wears off within a couple of hours or he switches to the "good" emotion.Negates the effects of good when it comes into play. Good: Each slash gives off a secondary slash of light.Negates the effect of the evil emotion and reverses them.Has a lasting freezing effect on organic matter. Determined:If determined and a wound is made on an enemy, that person's powers will be negated for their next two posts. He can also move at incredible speed, disappearing when he runs and being almost silent.If you manage to see him, he will be more or less a blur.He can exorcise demons with Yukine and even sever someone's memories of someone elses with Yukine.He has a 6th sense that can detect when someone is near and where they are coming from.He would get a chill when someone has a negative intention towards him when he isn't looking. Personality:Yato is often very playful and sneaky, doing silly and childish things such as buying good luck items that are obviously a scam, giving Yukine a childish jacket, and other things. He is very determined to become more popular as a god, often either placing his cell phone number everywhere or doing a job. However he also sometimes slacks off somewhere. There are also times, however, when Yato appears very serious and mysterious.Yato can be crude and unpredictable, although it is hinted that he can also be a cruel and merciless person. These actions might have been motivated by his need to at least exist in people's memories. Likes: Money, being praised, food, anything free, winning. Dislikes:Losing, being wrong, having to pay for something, unless it's a friend. Aspirations: Being respected and revered as a god. Special Traits: A kanji tattoo saying "God" in japanese on his right shoulder. History:He was born in a monk monastery, an oddball out of everyone.He never prayed to any of the gods, instead he called himself one.He eventually was fed up with the monks and ran away, taking Yukine with him. He has lived homeless and in search for jobs.He is always excited to do anything for money, from anyone no matter who.He thought if he did every job he was given, he would last in people's memories.